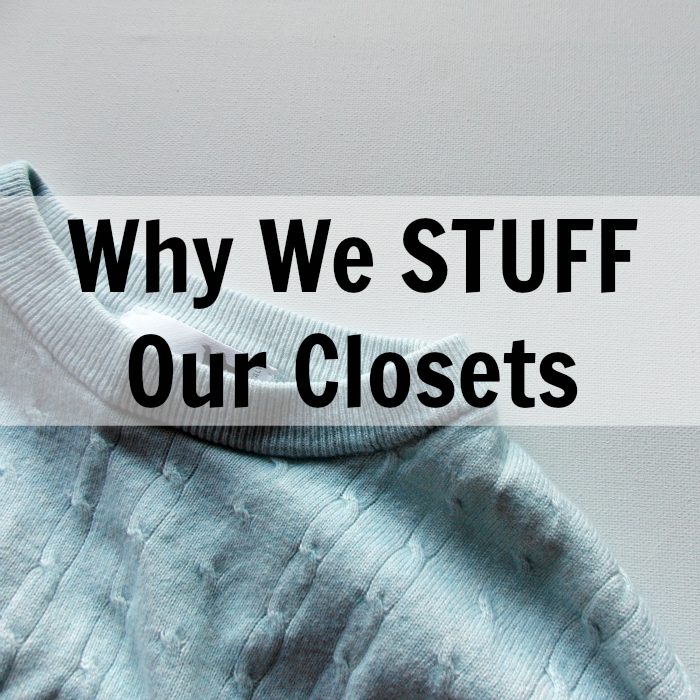 Why do we stuff our closets? Our closets are bursting with clothes but we continue to seemingly have a need for more. While we could survive on very few clothing items, a need urges us on. Is it the need to be stylish? Or powerful? Or "win" by finding the greatest deals? Clothes seem like a solvent for feeling happy, lonely, or sad. You've heard of emotional eating? I call this emotional stuffing. It's attempting to meet a need that can't really be met by clothes, but for the moment we attempt to. It's the same for me when I want unhealthy food. On the outside it seems like a simple longing for chocolate. But when I'm wanting unhealthy things, it's usually about more than the food. It can be my way of celebrating, pushing back pain or loneliness or staving off boredom. I've often thought of sugary goodies as a treat/reward for doing something hard, or a comfort through struggles. I've viewed it like I'm getting a secret surprise, when in reality, I'm sabotaging my own health goals. If I zoom in close, I can recognize that the food is not meeting my need. Instead I can remind myself that a "treat" would be going swimsuit shopping without dreading it, or hiking with my family without slowing everyone down. When I turn to food for comfort, celebration, or entertainment, I am wanting it to meet a need that food can't meet. The same is true for clothes or shoes. Yes, those things are nice; but they won't give you happiness, comfort or purpose in the long run. When we begin to meet our needs in real ways, we won't need large wardrobes to care for ourselves. So next time you're tempted stuff your closet (or your face), ask yourself why. Why in this moment do you want that? What is it that is triggering your actions? Is there pain you're trying to avoid? Are you wanting to do something meaningful? Get to the bottom of your why and meet the need in a real way instead of stuffing your face OR your closet! Do you struggle with emotional shopping, eating or other things? This a very timely post for me as I'm trying to cut down on eating sugar and emotional spending. I also find myself on my phone or in front of the TV to often, trying to avoid certain thoughts. These are all things I'm working toward changing and it feels like a long process, but it will feel wonderful in the end. I'm definitely an emotional eater and shopper. Thanks for this brilliant post!